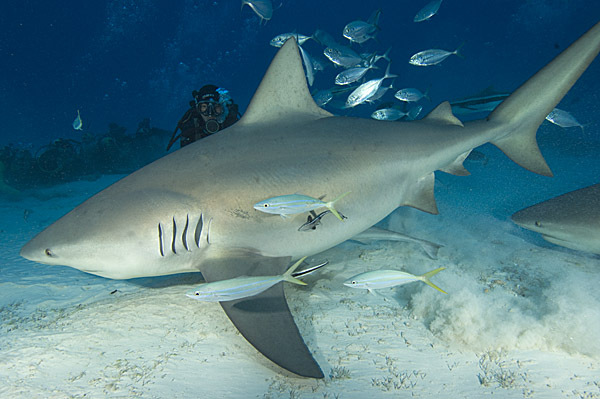 Bull Shark dive organized by Chino Loria / Phantom Divers near Playa Del Carmen, Mexico. Big beefy bull sharks! Sometimes just a handful but normally a dozen or so large female bull sharks attend the feed which takes place in 80 feet of water just a five minute boat ride away from Playa Del Carmen's main beach. The record number of bull sharks stands at 26 which must have been a chaotic encounter for the feeder. Divers follow the feeder down to the sandy sea floor and secure themselves to whatever rocks they can find to avoid being bowled over by the strong currents which are prevalent in this area. The feeder carries a bucket filled with fish scraps and hand feeds the bull sharks without the use of chainmail or any other protection. The sharks are reliably present between November and March but they seem to be staying a little longer each year. The visibility in the area is generally good and compared to other bull shark feeds like the one in Fiji, there are fewer baitfish to wreck your photos. This is a great feed; easy to get too, action packed and guaranteed unless the weather kicks up. Operators: The bull shark feed was pioneered by Jorge Loria aka 'Chino'. Chino is a very friendly guy and a true sharkoholic. He is the owner/operator of Phantom Divers in down town Playa del Carmen. He is in the process of developing a program that will employ satellite tags to find out more about where the bull sharks go between April and October. 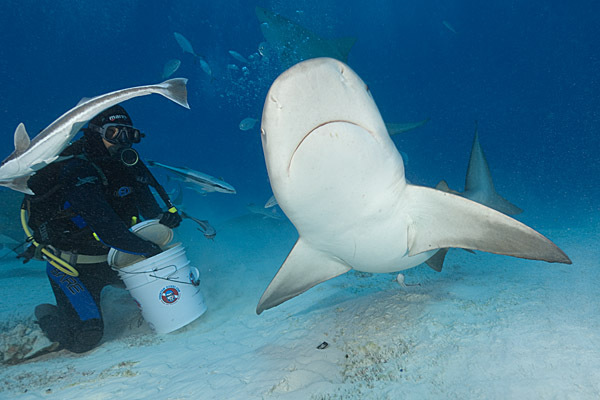 If you want to dive with bull sharks among a group of shark fanatics, try booking a trip through Shark Diver Magazine. Eli Martinez the Editor of SDM now runs reader trips over the winter to Playa specifically to dive with the bulls each day. SDM trips tend to be a little more intense than your average 'dive trip with a shark dive tacked on'. Go to the Shark Diver Magazine website for more details.